The list of Wymeswold vicars on display inside St Mary's church has also been transcribed. Download the PDF for free. Have you ever wondered how many talks have been organised by the WHO since it started? It's getting on for 250! This PDF reveals the titles and speakers of every one. These are part of an ever-growing series of videos about local history and related topics which can be found on Bob Trubshaw's YouTube Channel. Are you looking for a 'little project' to keep you amused? The WHO committee would like to increase the range of information available on this website and is aware of several opportunities to add information that will be of interest to members and those living 'wider afield'. The first simply needs 'typing up' although the others require more effort, while the final suggestion is more 'open-ended'. You do not have to be a member of the WHO, or even live in the area, to help. Transcribe William Fox's property deed. Indexing the main topics in St Mary's Wymeswold Church Council Minute Book. Indexing the main topics in the Wymeswold school log books. The WHO has a photocopy of a printed broadside with the headline 'Horrid murder'. The dreadful deed took place somewhere in Wymeswold and the names of the alleged perpetrators are given, though not the name of the victim – a child. But we don't know which year this was published. Internet search engines shed no light. If you fancy a spot of 'sleuthing' through relevant parish registers and court records then please get in touch with Bob Trubshaw. This would make a good project for someone new to doing local history research – Joan Shaw will happily provide advice. Contact the Women's Institute office in Leicester to establish what records they hold for the disbanded Wymeswold WI. As a follow up a short history of the branch's activities could be prepared. Ideally the person doing this would be a former member of this WI branch; if not Bob can put you in contact with one of the long-standing committee members. And, last but not least, can you think of anything else which the WHO has yet to research? Especially if it relates to villages in the Wolds other than Wymeswold! 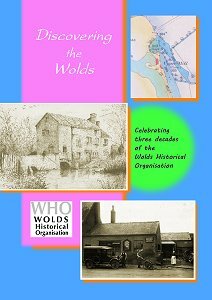 The Wolds Historical Organisation is thirty years old in 2017. To commemorate this anniversary the members have compiled a book about various aspects of the history of the Wolds villages, from the Anglo-Saxon era onwards. The title is Discovering the Wolds. Anglo-Saxon boundary shrines of the Leicestershire Wolds, John Noon of Burton Hall, the Inn at Prestwold, the Burton Parish Constable 1810–1836, sale of a Wymeswold Farm in 1839, the Loseby family, the early years of the Wymeswold Bowling Club, the Lymeswold cheese myth and a look back at thirty years of the WHO. Email bobtrubs@indigogroup.co.uk or phone 01509 881342 for information on how to obtain. Phil Thorpe's article on the Lowesby family is available as a free PDF. Additional information on earlier and later members of the family is also available as a free PDF. Wymeswold 1939 –1958 The streets were dirty and poorly lit at night. There were very few ‘mod cons’. Hardly any of the houses had central heating. In the forties there was no mains water and no television before about 1948. We had a telephone, most didn’t. Some people had cars, most didn’t. There were few washing machines, hardly any fridges, no dishwashers and certainly no mobile phones! But was it Paradise? 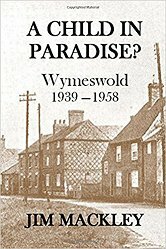 In this book Jim Mackley, a Wymeswold boy, remembers what the village was like from the dark years of the war to the golden years of the late fifties. His friend, Stan Sheppard, also recalls his memories of Wymeswold over the same period. The book is illustrated by photos and newspaper cuttings covering a longer period. Most of the inhabitants of the village in the forties and fifties are listed in an Appendix. £4.99 plus postage. Only available from Amazon: A Child in Paradise? I started school at St Mary's Primary school in Loughborough in 1953. Shortly after I started, we were told that a number of new children would be coming and they didn't speak like us (a concept that was totally unknown to us). This was the beginning of the Polish children coming from the [Burton on the Wolds] camp to our school. They had a dedicated bus and the children were all dressed identically. I remember being envious because the girls had lisle stockings and leather boots with a zip. I insisted that my mother change the style of my plaited hair so that it was similar to the girls. I was never aware of any problems and everyone rapidly integrated. The Polish children maintained their language and culture at their 'Saturday school'. I had a Polish friend who was rehoused near my family [in Woodfield Road, Rothley] from the Burton camp. The father had a job but my friend and I accompanied the mother to find a cleaning job.We waited behind a hedge whilst she was interviewed, despite minimal English, at one of the large private houses near Rothley station. A great attraction for me was their welcoming me and sharing their sausage and cabbage, and especially their television. I used to watch Dr Kildare & various other programmes on Friday and Saturday evenings. I also remember that the father had got numbers tattooed on his wrist. It was several years later before I understood the significance that he had spent time in a concentration camp. Thanks to Helen fortaking the trouble to share her memories – please email bobtrubs@indigogroup.co.uk if you also have recollections of the Wolds area. See Joan and Peter Shaw's article on The Polish Camp at Burton on the Wolds for more information about where Helen's friends lived. As part of the Strategic Stone Survey, Historic England commissioned the British Geological Survey to prepare a set of atlases covering the building stones of the English counties. The information for each county is quite detailed and offers a whole new way of approaching the history of each area. Houses and churches little more than ten miles apart may be constructed from quite different building stones – these atlases remind me of the I Spy books intended to keep me amused on childhood car journeys! Thanks to Nicholas Jenkins for drawing attention to these atlases. If the name 'Dalby Wolds' means nothing to you it's because this is the name given to a proposed 'garden village' of 2,700 houses. (Since when did villages have nearly 3,000 houses, with space for further expansion?). This new town would replace Six Hills golf course and agricultural land in the triangle of land bounded by the Fosse Way, the A6006, and the road from Barrow on Soar and Six Hills going north-east to the A6006 and on to Eastwell (also a Roman road). As part of the development proposal there has been an assessment of the archaeology, including a geophysical survey. Relevant reports are online at pa.melton.gov.uk/online-applications/applicationDetails.do?activeTab=documents&keyVal=OYP37WKOL4K00. The survey notes there are cropmarks 'potentially representing below-ground remains of two undated enclosures' (and the best guess would be Iron Age or early Romano-British) and two rectangular earthwork enclosures, potentially of medieval origin. A Roman milestone was discovered close to Six Hills, while Roman pottery and tile have been identified in two locations near the boundaries of the proposed development. More predicatably, the 'geofiz' also provided lots of evidence for ploughed-out ridge and furrow. Not a lot of archaeological evidence given the size of the area evaluated, but this is consistent with the seemingly sparse settlement elsewhere on the Wolds – despite the close proximity to the Roman small town at Vernemetum (where the Willougby to Old Dalby road crosses the Fosse Way) and the use of Six Hills as a meeting place (or 'moot site') in the later Anglo-Saxon era. Thanks to Hellen Jarvis for drawing attention to these reports. Katheryn Timmons, who heads up the Barrow on Soar local history group, kindly allowed me to photograph an original indenture, or 'conveyancing deed', dated 5th April 1780 which assigns land in Wymeswold parish near Burton 'great field' (this is before Enclosure) to William Fox. If anyone is willing to transcribe the main parts of the text – the handwriting is quite legible – or knows more about this William Fox then please email bobtrubs@indigogroup.co.uk. The original deed will be donated to the Record Office. Those with long memories may recall the discovering of a human skull back in 2003, prior to the building of Manor Court in Wymeswold. There was an article about this in the second Wolds Historian – the article is online. At the time of the skull's reburial there was no guidance about the most appropriate ceremony for non-Christian human remains. But a year or so later a group of people came together to form an organisation called 'Honouring the Ancient Dead' or HAD. More details about HAD here. At the request of the HAD committee the Chair of the WHO, Bob Trubshaw, was videoed recalling the events. This video is now online. Thanks to Jonathan Allen for shooting and editing the video and Sarah Levitt for making it all happen. Over the last thirty years the WHO has built up a collection of research notes, old photographs, a few artefacts and such like. Collectively it has been named the 'WHO Archive'. Until now few people knew what was in this archive and even fewer knew where to find it! However now there is a PDF which can be downloaded and searched (use CTRL+F if there's no obvious search button on your PDF viewer). Please note that the archive is stored in six different locations, few of which are easily accessible. So requests to provide more details or to view anything 'first hand' will take time and effort. A member has suggested that the photographs of artefacts would make a suitable web page. So here it is: the WHO's 'virtual museum'. The Church Council Minute Book for St Mary's, Wymeswold, covering 1932 to 1955 forms part of the archive, although it is in a rather fragile condition. This has now been digitised. There are too many files to make this available online but they can be copied to a memory stick or such like if anyone wants to read through. Note that the handwriting is often rather 'cramped'. If anyone is willing to read through and index the main topics this will be most helpful. From a quick skim through it seems there's plenty of information on the church restoration of the 1950s. The school log books for Wymeswold school covering the period from 1875 to 1982 are now in the Record Office for Leicester, Leicestershire and Rutland. But before they were handed over they too were digitised. Again they can be copied to a memory stick or similar if anyone thinks they have relatives at the school during this period. These log books were helpful to Ivor Perry when researching Bringing Them Home as they revealed both the good and bad sides of the village 'lads'. If you would like to have copies of any or all of these then email Bob Trubshaw. Note: please supply your own memory stick or SD card! The church minute book is under 1 gigabyte and all four school log books are just over 2 gigabytes. Prints of Philip Brown's historic photographs of Wymeswold and the surrounding area, taken between the 1890s and 1920s, are available again. Contact Chris Brown cbrown.chris86@gmail.com for details. 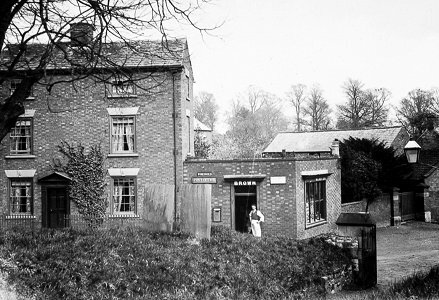 The Brown's shop, and former Post Office, in Church Street, Wymeswold. 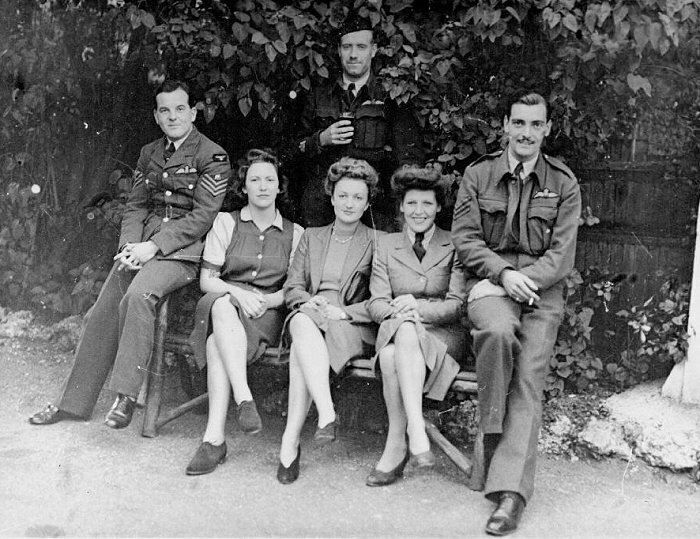 Carolyn Dee emailed to say her partner, Leo Carter, served at RAF Wymeswold with No 9 Squadron from 5th June to November 1945. She sent a scan of a photograph, with Wymeswold written on and ' Betty's demob party, Wymeswold about November 1945' . She assumes Betty is in the middle. The other photograph with people sitting in the garden may also be Wymeswold or Burton on the Wolds. but Leo didn't add any information. 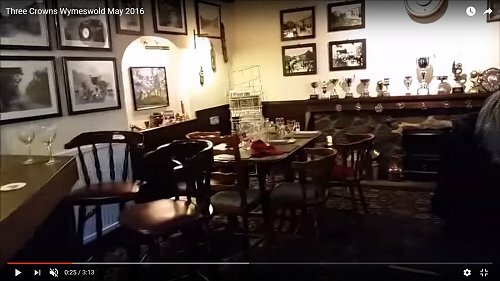 Were they taken at the The Greyhound Pub? Carolyn wonders if anyone recognises anyone else in the photographs. If so please email Bob Trubshaw. Again Gordon wonders if anyone recognises anyone else in the photographs. If so please email Bob Trubshaw. Click on the image for a higher resolution version of this image, if that helps to recognise faces. 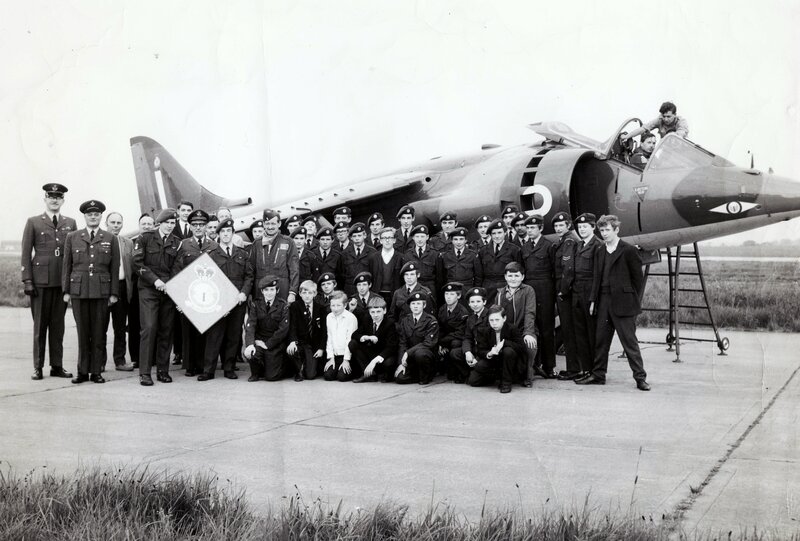 During a web search I found your site and was blown away to find a photograph of an event at which I was present – the visit of 1(F) Squadron ATC to our illustrious and heroic name bearers 1 Squadron RAF at RAF Wymeswold. Our Flight Lieutenant was rightly tight-lipped about the whole trip, and gave nothing away to us ordinary ranks beforehand. On the coach we made guesses and surmised that we were off to a Bloodhound missile site. We drove off the road through a wood and came into a little clearing, and there sat the Harrier. I think the modern phrase is gobsmacked. Most of the squadron were inner-city kids from Leicester; not easily impressed, but gobsmacked we all were. The pilot Squadron Leader Bryan Barr put on a flying display, just for us – just for us – of its vertical and short take-off and landing capabilities. I can honestly say that it was one of the best nights of my life. I can recall the photo hanging on the squadron hut in Leicester. I'm the young man kneeling below the Commanding Officer. Sadly I'm terrible at names these days following a surgical trauma, but the chap immediately below the RAF roundel on the engine nacelle was Flt Sgt Jim Leadbetter. He joined the RAF and eventually became a test pilot himself at the Empire Test Pilot School (EPTS) at Boscombe Down. The other special thing about the photograph is that the aircraft in the photo was XV744, one of two RAF Harriers that competed in the Daily Mail Transatlantic Air Race in 1969, flying from central New York and landing behind St Pancras station. It was later upgraded to GR3 status and had a distinguished service career, and is now permanently sited in Tangmere Aviation Museum in Kent. Steven Baker emailed April 2018 and corrected the spelling of Bryan Barr's name. Barr went on to become Wing Commander and was Commanding Officer of 233 Harrier Conversion Unit at Wittering, then Commanding Officer of 4 Sqn at Wildenrath (on Harriers) and later flew Harriers again as Air Commander in Belize. Steven also says the Commanding Officer, Ken Hayr, was a Wing Commander at the time of the photograph; he became a Group Captain later. 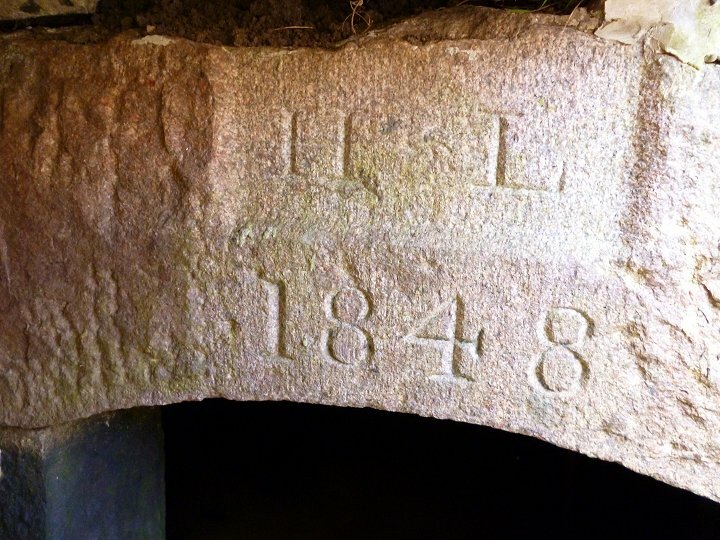 Sandy Haddington sent photographs taken inside Sister's Well, on the edge of Wymeswold Airfield. One of them showed an intriguing inscription. Details in this new article.